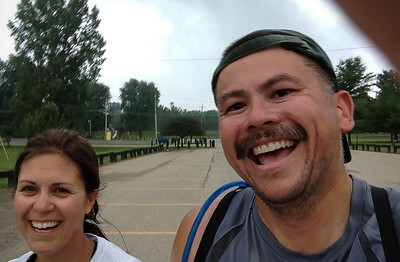 Today's crazy adventure: A 47-mile dryathlon between Midland and Sanford with Lindsay Knake to mark my 47th birthday. 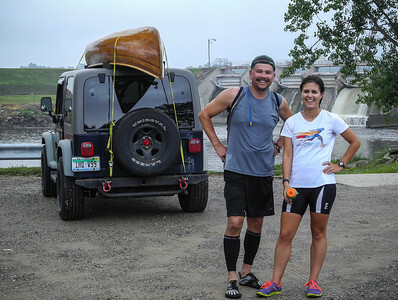 The stats: 8.5 miles running—1:28; 10.6 miles canoeing—2:53; 28 miles biking—2:00. And a shoutout and big 'thank you' to our support crew--Barbara Sheltraw and Dennis Andrews! Whew, good thing we are not running to Saginaw! The M30 tunnel in Sanford means we are in the stretch. We made it to the park in Sanford...8.5 mile run and still smiling. First leg done, two more to go. 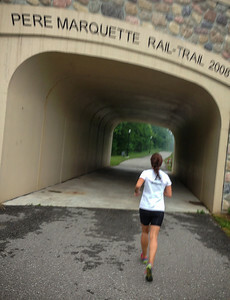 Ran from Midland to the best little town by a dam site, Sanford, MI., in just under an hour and a half. Thanks for slowing down for me, Lindsay! 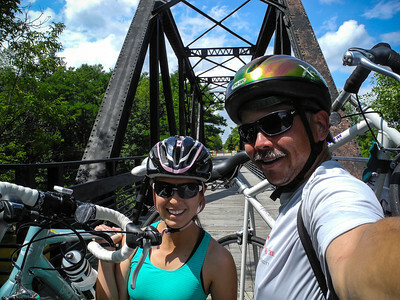 Our first view of the rail bridge in Sanford. 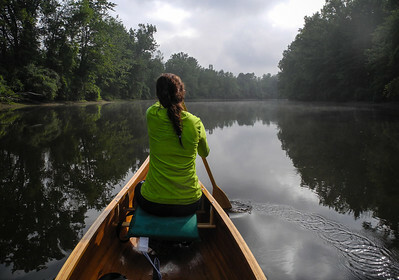 Mist hangs over the water early during a perfect day on the Tittabawassee River. 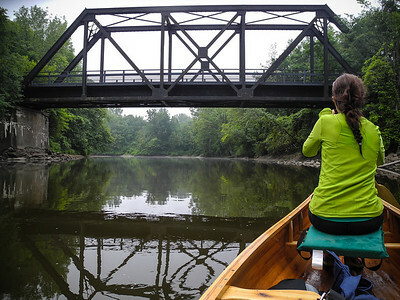 One problem: The still conditions mean powering through the entire trip--no cheating on the current. Gotcher back: A damsel fly lights on a turtle's back as the turtle suns on a Tittabawassee River log. 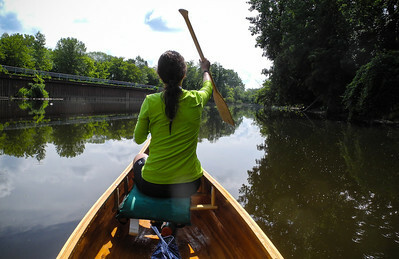 A run, canoe, bike trip isn't complete without bananas, plums, pears, sport drinks and water—and a time out to stretch on the riverbank after sitting in a canoe following an 8.5 mile run. 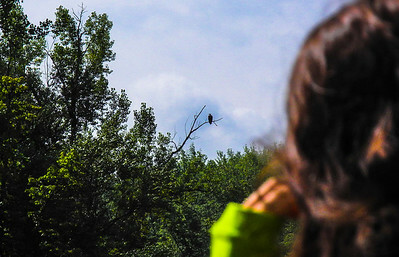 We followed this bald eagle for about 4 miles along the Tittabawassee River. Was he pondering what it would take to carry us off? 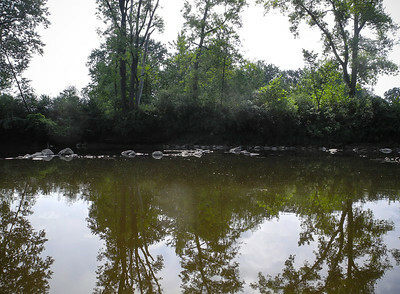 Lots of interesting river terrain on this stretch, but the low water had us dragging bottom a few times. 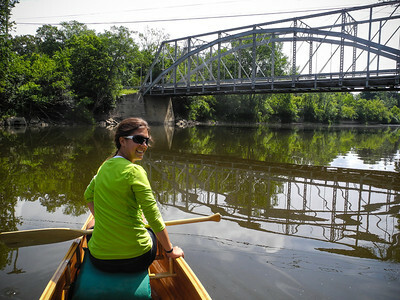 Lindsay makes a seamless paddling transition as we approach Emerson Park in Midland. It's my first time seeing this bridge from the river side. Can't help but think of the spring floods raising the water level over the top. Second leg of the trip almost complete as we cross the Currie Parkway bridge. Our bikes are just on the other side. 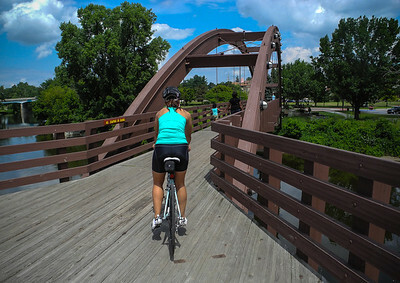 Lindsay rolls on the bike trail from Chippewa Nature Center. We had to dodge quite a bit of foot traffic on the Tridge. Loving my new platform ATB pedals on my road bike. They let me stick with FiveFingers for the entire dryathlon. 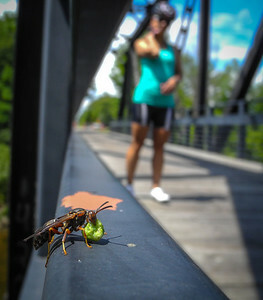 More wildlife--luckily this wasp already had a mouthful so it couldn't bother with us on the Sanford rail bridge. 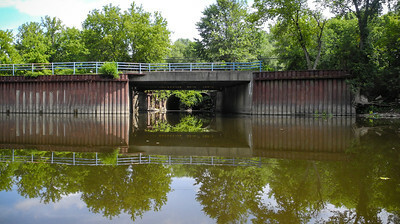 Our final view of the rail bridge in Sanford. This is start of the last leg of the last leg of our 47-mile dryathlon.